Why was my question moved, and why was it then deleted off of the original site? I logged into Super User today to find it had been moved. I don't see anything server-specific about the question however. 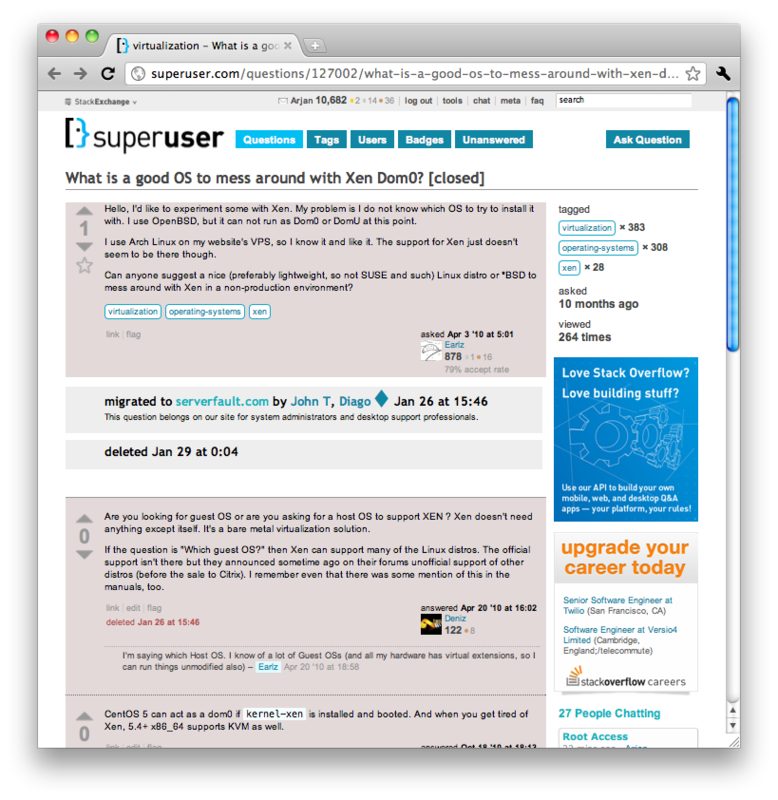 And what is more troubling is that I can not even see who closed the question because the original question on Super User has been deleted (which I didn't think was possible, and I definitely don't think is a good idea). So why was my question moved, and more worrying, why was the original question deleted? There is a process that automatically deletes migration stubs after 30 days. Since we auto-redirect on deletion to the target site, the migration stubs are of no lasting value on the source site. Typically virtualization questions belong on serverfault, especially concerning Xen as it's so frequently used in server environments. In other words, Xen professionals are more likely to be on and help out at serverfault than on superuser. Not the answer you're looking for? Browse other questions tagged support specific-question closed-questions .